The Rugby to Wolverhampton route was essentially built by two railway companies, the section from Birmingham (Curzon Street) to London via Rugby being built by the London & Birmingham Railway (L&BR) whilst the section from Birmingham New Street to Wolverhampton was built by the Birmingham, Wolverhampton and Stour Valley Railway Company under the auspices of the LNWR. The L&BR, together with the Grand Junction Railway and the Manchester and Birmingham Railway, having merged together to form the London & North Western Railway whilst the BW&SVR line was acquired by the LNWR. The section of line between Curzon Street (the original L&BR and GJR termini) and New Street was built by the London & North Western Railway. The following is an extract from one of Reg Kimber's scrapbooks compiled over 50 years. WHEN the London arid Birmingham Railway was opened in its entirety, on September 17, 1838, the promoting company secured the dual distinction of owning the first main line to enter London, and the longest railway system then in existence - 112 ¼ miles. At the time it was visualised as the great trunk railway from London to the North, but the developments in transport services that were witnessed imparted to the enterprise a significance, far exceeding anything the promoters' had anticipated. Branch lines from Blisworth to Northampton and Peterborough, and from Coventry to Warwick and Leamington and later the Birmingham and Derby Junction Railway linking up at Hampton-in-Arden, provided arteries through which traffic of all kinds poured in a continuous stream. 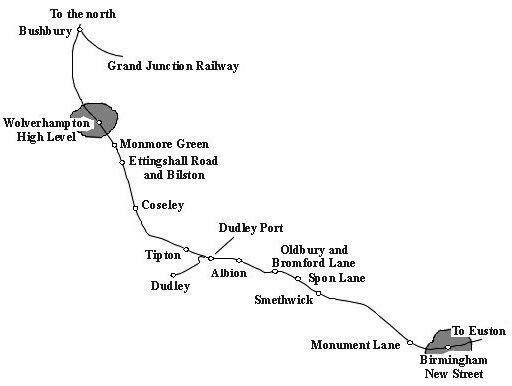 Moreover, the Grand Junction Railway from Birmingham to Liverpool; the Liverpool and Manchester, with such subsidiary lines as the Warrington and Newton; the Wigan and Preston; Preston and Lancaster; and Lancaster and Carlisle, some of which had been planned without any relationship to the others, opened up facilities for direct communications between London and Carlisle, a distance of 299 ¼ miles. Thus - the way was paved primarily for the union of the London and Birmingham and Grand, Junction railways under the title of the London and North Western Railway, and eventually for the great grouping scheme which brought eight constituent and 27 subsidiary companies - owning 6,334 route miles, and 19,383 track miles, into the London Midland and Scottish system. It is on record that no private Bill was ever more strictly scrutinised than that of the London and Birmingham Railway in spite of the weight of argument brought to the support of the proposal by industrial interests, which were suffering heavily from the lack of adequate means of transport, it took two years to get the Act sanctioning the undertaking through Parliament, and from first to last, the most determined opposition had to be encountered both in and out of the House of Commons. While the work of construction was in progress anxieties and difficulties accumulated. Almost immediately there was a big jump in the price of materials. At one period seven contracts were thrown on the company's hands. A sum of £370,000 more than was bargained for had to be paid for land, the price averaging £315 per acre in the Birmingham area, and £335 per acre in London. Up to January 1838, the expenditure, as a result of unexpected troubles had exceeded the estimates by nearly one and a half millions, aggregating £3,931,829. Both at Euston and, the Birmingham terminus at Curzon Street imposing station buildings were erected. The structures in each case were of bold design, with Doric porticos, and the new notes struck in, this direction, as well as in the engineering works and general constructional details, - added to the public interest with which the opening of the line, was regarded. As early as 7.15 a.m. on the chosen day a special train left Euston for Birmingham for the inaugural run the passengers including Mr George Carr Glyn, the chairman of the Company, together with the directors and visitors, Mr Stephenson, the, engineer, Mr Bury, the locomotive superintendent, and Mr Creed, the secretary, while HRH the Duke of Sussex travelled with the party as far as Rugby. The visitors spent one hour in Birmingham, and then returned to Euston, where a ceremonial banquet was held. All along the route the greatest of enthusiasm was displayed, and the passing of the first ordinary train, timed to leave London at 8 am., was the signal for local festivities at all the stations on the new part of the railway. Change was the order of the times, and Denbigh Hall station, a well- known landmark.-was demolished, the materials being used in the building of the station at Bletchley. But it was in the increased power and influence of the railways that that most convincing results, were achieved, The London and Birmingham succeeded on its merits. As indicated, it was well served by its branches and a further strengthening factor was found in the Midland Counties line, which, joining up at Rugby on July 1, 1840, handed over its traffic from Derby, Nottingham, Leicestershire, and the north for conveyance to London. As an independent line, the London and Birmingham Railway lasted for eight eventful years, and when the merger with the Grand Junction was effected, its chairman, Mr. Glyn, continued to act in the same capacity with the London and North Western. The new and large company became, from its inception, a challenging force in the railway world. Owning what was given the proud title of the "Premier Line," though of less mileage than the Great Western, and smaller capital than the Midland it was able to show the largest annual revenue and was richest in rolling stock. It was particularly fortunate in its executive, at the head of which stood Captain Huish, one of the most able railway administrators and diplomatists of the age. A masterful man. Captain Huish was as enterprising as he was resourceful, and he was responsible for important developments in several directions, though his methods sometimes exposed him to sharp criticism. In 1846 the London and North Western Company established at Crewe the largest and most complete locomotive works in the Kingdom, and here the genius of such famous locomotive engineers - as Francis William Webb and George Whale found expression in engine designing on a scale and of a standard that excited the envy, if not always the admiration of rivals. Webb was the originator of the track trough system; which enables expresses to take up water while travelling at speed, and, apart from introducing this innovation, the London and North Western was the only one of the principal railway companies to apply names to all its express locomotives. The earlier railway plans affecting Birmingham had contemplated the erection of separate stations for the London and Birmingham and Grand Junction Companies in Broad Street. Curzon Street, however, offered a better point of entry into the city, and in the plans of 1831 this locality was favoured for the central station. But in the light of subsequent expansions attention was directed to New Street, and on June 1st, 1854, the station here was opened for all passenger traffic, and Curzon Street became a goods station only. In one other respect the London and North Western was conspicuous, holding the monopoly of the through route from London to the north until 1850. The whole career, of the London and Birmingham railway was worked out amidst the, changes and, chances of transition. Conceived when prejudices against railways ran deep and strong, it contributed in ways of its own to the revolution represented by the public surrender to the magic of speed. The cost estimates for the building of the 112½ mile London and Birmingham Railway were hopelessly optimistic. The original incorporating Act of Parliament had authorized the raising of £2,500,000 via £100 shares. However by the time the line from Euston Square to Curzon Street terminus in Birmingham opened as a through route on 17th September 1938 two further Acts had been needed to raise the capital to £4,500,000. [The company had obtained £2,375,000 from shareholders and £2,125,000 via loans.] This still proved inadequate and in the spring of 1839 the railway had another Bill before Parliament seeking authority to raise a further one million pounds through a third share issue. The minutes of the evidence taken during the committee stage of this Bill, in March and April 1839, provides a fascinating insight into the early operation of the railway. The main aim of the committee was to lay bare the financial position of the company and to determine whether or not the raising of this extra capital was really justified. However the dissecting questions put by legal council to the company secretary, general superintendent and one of the directors also reveals a lot about the operational arrangements at a time when, just like the embankments, things were still bedding down. The interrogation of the railway officers revealed that the company had been somewhat devious in the way it had raised its funds. It had also exceeded the authority Parliament had given for this. Mr Creed the company secretary was forced to admit that beyond the £4½ million approved capital the railway had other borrowings and debts, as at 15/3/1839, of £631,000; or maybe more. Much of this borrowing had been secured against future revenue. It was therefore rather presumptive to come back to Parliament with a request to raise an additional £1million when the railway had actually already spent around 2/3 of this sum. Parliament was hardly able to refuse and allow the endeavour to fail. Existing share holders had not been required to pay the full amount for each share. For the original £100 shares only £90 had been paid up. These shareholders were then offered, pro-rata, £25 shares for which they only had to pay £5. The remaining amount had been borrowed against the security of a call upon the shareholders for the outstanding value of the shares. This put the holders of the £25 shares in a very favourable financial position. They received a dividend on the full £25 share value yet had only paid out £5. In the 6 months since the full opening of the railway this had given a 35% annualized return on the £5 investment. Knowledge of this had inflated the value of these shares which could be sold at a very healthy profit. However if the shares were retained and the loans then paid back out of the general revenue of the company the shareholders might never have to pay the remaining £20. The company officials had to admit that this arrangement for raising funds by borrowing rather than calls upon shareholders had been wrong. Their excuse was that if they had not done so construction would have been delayed or postponed. The committee tried to impose ways to correct the matter but legal council insisted that this was impossible without breaching legal obligations to lenders and upsetting the general money markets. It was agreed though that future share issues would not be managed in this way. The questions put by the opposition lawyers reveals a mentality stuck in the canal and turnpike era. No doubt this would change dramatically in the coming years. The peak of the railway mania was less than a decade away and 1846 was to see the greatest number of railway Acts submitted to Parliament in a single year at 271. They seemed unable to grasp the concept of a unified fare covering all the cost of a journey on the line. Repeatedly the company officials are asked what part of the charge was for the toll and what for locomotive power. The company accounts were not ordered in a manner able to answer this. The London and Birmingham was principally a passenger railway. At the time of the committee hearings, six months after through route opening, it was running 7 trains on weekdays and 4 on Sundays in each direction. There were 4 classes: second class open, second class closed, first class and the mail coach (the most prestigious). Open meant no protection whatsoever from the elements. This was basically a 4 wheeled truck with benches and capable of carrying up to 24 passengers. The closed second class carriage was used with the night mail train. The fares for the full trip were 20s, 25s, 30s and 35s respectively. This was about 2d, 2½d, 3d and 3½d per mile. The most profitable were the second class passengers. This was simply because more could be crammed into each carriage and these carriages cost much less to manufacture and maintain. The unlined (i.e. non-upholstered) second class carriage cost £130 to £150. In comparison the first class carriage cost £460 to £480 and accommodated only 18 passengers. These were more prone to wear and tear and needed repainting and relining at least annually. The mail coach cost £500 to £520 and had a coupe for 2 and a compartment for 4, with 2 to 4 outside seats. An audit during October 1838 showed the ratios of passengers, mail : first : second as 1 : 2.5 : 3.2, i.e. one mail coach passenger for every 3.2 second class passengers with a average fare of around 2¾d per mile. When compared to airlines today this is a healthy proportion of higher tariff passengers. The fact that the railway was making little profit from the more prestigious clients suggests that the fare differentials were too low, i.e. they weren't charging enough for the first and mail passengers. The committee suggested that the railway revenues might improve if they lowered fares to attract more passengers. There had been a debate amongst the directors about this but it was a dangerous strategy. Mr Boothby, the director examined by the committee, stated that if fares were reduced by 1/3 it would be necessary for the traffic to double to generate the same dividend. Indeed when the line had been partially opened from London to Tring in September 1837 the fares had been much lower and the railway had operated at a loss. At any rate trains were running well below capacity. The average loading was 55 persons per train whereas if full of second class passengers the maximum was around 200. The journey time between London and Birmingham was 6 hours for first class trains (stopping only at principal stations) and 6½ hours for second class trains stopping at all stations. The fastest train was the day mail which did the journey in 5 hours which is an average speed, including stops of 22.5 mph. This was barely twice the fastest stage coach of the era at a time when the main turnpike roads were in generally good order. The dedicated first class trains highlighted social class divisions and prejudices. Quoting directly from the minutes, Q: Would there be any objection. . .that one second class carriage be attached to each first class train? . . . complaints are made, on the part of gentlemen, that servants, when traveling by a first class train, are frequently placed by the side of ladies in the same carriage, sometimes eating a mutton chop, and at other times a pork pie; besides which, gentlemen are obliged to pay the expense of the first class train for their servants. A: . . .the board (of the railway) has provided, outside the first class carriages, seats in which they may put their servants at the second class fares. The outside seats were placed high up at the ends of the carriages in the manner of stage coaches. This was a very exposed position and one can imagine the experience passing through long tunnels at the slow running speeds. A concession to female servants on these first class trains was that they were allowed to ride inside at second class fare. The conveying of horses and their carriages was the most unprofitable traffic. The power needed to draw one horse in a box was thought greater than that to pull a passenger (railway) carriage. Gentlemen's carriages and horses needed to be at stations at least a quarter of an hour before the time of departure. Trucks (flat wagons) were kept at the principal stations but to prevent disappointment it was recommended that these should be booked in advance. The rate for a carriage with four wheels was 75s for the whole distance, but if two carriages with two wheels could be placed on one flat wagon this was only 55s. The fare for a horse from Birmingham to London was 50s, i.e. the same as one second class + one first class passenger, but requiring its own box. Passengers that remained either in or on gentlemen's carriages, and grooms in charge of horses were charged second class fares. This was the motorail service of the 1830s. The secretary was asked about speeds on other railways and he thought the Liverpool and Manchester managed 30mph, and the GWR 35mph. His excuse for the relative slowness on the L&BR was the need to pass carefully over some of the embankments which were still consolidating, and the disciplines of adhering to a published timetable. In places speed restrictions were 10 mph or less (where now Virgin pedolinos whisk by). The evidence often makes comparison with the Grand Junction Railway, which ran from an adjacent terminus in Birmingham to Warrington and thence to Liverpool and Manchester. At this time that railway used a starting departure time but unlike the L&BR didn't wait for time at intermediate stations and had a generally poorer punctuality record. During these first months it was proving impossible to accurately predict the cost of operating locomotives. The plan had been for Mr Bury (of Liverpool) to manufacture and run locomotives under contract at a farthing per passenger mile and ½d per ton of goods per mile. This was based on early experience with the Liverpool and Manchester railway. These figures were quickly found to be invalid. Even on the L&MR locomotive costs rose substantially after 3 or 4 years when heavy repairs to the engines became necessary. On the L&BR the higher cost of coal and poorer than expected passenger numbers were other factors that pushed up motive power costs. The anticipated increasing speeds would also raise fuel consumption and increase wear and tear on locomotives and track. By April 1839 the figure had reached 7 shillings and 16 pence per passenger mile and was still rising. The idea of a contract was dropped and Mr Bury's services were hired on a salaried basis and the company itself took direct control of locomotive finances. Mr Boothby (company director) reported that locomotives for passenger work were of a different power from those intended to convey merchandise. They were all of the 4 wheeled type as was the case on the Liverpool and Manchester, North Union, London and Southampton, Bolton, and Midland Counties railways at this time. The only 6 wheeled engines on the L&BR were for ballast trains. The Grand Junction Railway however used exclusively 6 wheeled engines. Robert Stephenson, chief engineer for the L&BR, was an advocate (and manufacturer) of 6 wheeled locomotives. The company may not have wished to be unduly dependant on him and thus turned to Mr Bury for its locomotives. Much of the questioning was to determine how open to competition the L&BR was. This included whether they would allow locomotives from other railway companies to operate on the line. Much of this revolved around practical issues such as access to water and station facilities. The company officials conceded that the legislation allowed others use of their facilities but in reality they were not going to let this happen easily. They insisted that any individual arrangements they had already made did not set a precedent for everyone else and that water would only be supplied at an appropriate price decided by them; otherwise let them build their own stations and pipe-work. They were quizzed as to whether the GJR's 6 wheeled locomotives would fit on the L&BR turnplates but not definitive answer was provided. In the transport of goods the role of the railway was just to provide the locomotives and wagons. It was not itself the carrier. If the public wished goods to be sent via the railway this was organized by other businesses that also took care of the movement of goods to and from the railway premises. These carriers in effect purchased capacity on trains and were obliged to cart items away from stations within 6 hours of arrival. The Bill (i.e. the request to raise more money) was opposed by one such carrier, a Mr John Robins. His objection was that the railway was giving preferential treatment to Pickfords and Co, who would been the sole carrier when the line first opened. [Some of the evidence given did suggest that they had enjoyed a generous mark up on the carriage of some goods and that competition from other carriers would bring charges down; both on the railway and canal.] Mr Robins claimed that the railway was not honouring its legal obligation to allow free and fair competition and to deal with all users of its facilities on even terms. Initially the company denied this but questioning quickly revealed a conflict of interest in that the General Superintendent of the railway, a Mr Baxendale, and a share holder in it, was also a partner in Pickfords and Co. The committee put pressure upon the railway officials to be more overtly and fairly open to all carriers. A general fee structure for all carriers could not be agreed because of the issue of empty wagons traveling back from London to Birmingham  and who should pay for this. In the transport of goods the railway was in competition with the canals. The railway was more expensive but offered greater speed. There was a demand to hurry goods from the north to London for sale or export. There was less to transport in the other direction and less of a rush. There was therefore unused capacity within the wagons returning to Birmingham and the company suggested, as an experiment, charges to carriers of 30 shillings per ton from Birmingham to London and 33 shillings in the opposite direction. Understandably not all carriers were happy with this. The average daily movement of goods between September 1838 and March 1839 was 72 tons 6 cwt. Nowadays this could be done by two lorries! The railway was only interested in handling the more lucrative general merchandise and in relatively small amounts. There was no intention to transport heavier goods such a stone and coal. The canals could do that. The company provided wagons and locomotive power at a charge of 12s a ton per round trip, to and from London and Birmingham. These figures are a little at odds with those above but this may be because they do not include the toll component, i.e. the access charge. Freight charges seem to have been in a state of flux because of the uncertainty over locomotive costs. A wagon could carry up to 4 tons but this was soon restricted to 3½ tons. Loading was though not to be less than 2½ tons. One locomotive could only manage a train of 100 to 120 tons. Where necessary double heading, rather than banking was used. This was recommended if a passenger train consisted of more than 12 carriages, or 14 in good weather. Fare dodging had been frequent in the early days, both from passengers traveling in a higher class of carriage or beyond the destination which their ticket allowed. As much as £50 or £60 had been recovered in one week. The practice had been curtailed somewhat by requiring tickets to be presented at the last station before London or Birmingham. Checking tickets in transit was considered impractical as it would have involved employing a guard in each carriage. When asked about cost comparisons with other railways Mr Boothby (company director) gave figures per mile of £24,000 for the Grand Junction Railway, £42,000 for the Liverpool and Manchester and around £50,000 for the L&BR. His justification for the differences were that the quantity of earthworks on the L&BR had been nearly four times that on the GJR, with numerous expensive tunnels, viaducts, embankments and cuttings. There were large over spends (and delays) on Kilsby tunnel and Blisworth cutting. The 1¼ mile extension from Camden to Euston had been particularly expensive at between £300,000 and £400,000 once property purchases were included. Not one of the 30 main contracts had been completed to budget. For all of this the humble navvie was paid 4/6 (22½p) a day + beer. The Act authorizing the requested additional £1million was passed on 14th June 1839 but, in the words of John Britton in his account of the line published that year, granted (only) after a long and searching investigation into the affairs of the Company. 1. It took over the Birmingham Canal Company. 2. It leased the line under the terms of an Act passed on 1st July 1847 which would prevent the Shrewsbury & Birmingham from using the line if they joined the Great Western Railway, who were intense rivals of the London & North Western. 3. By making the Wolverhampton General station (High Level) and the section to Bushbury joint property with the Shrewsbury & Birmingham in an Act of 9th July 1847, which also gave the Shrewsbury & Birmingham running powers over the Stour Valley Line. Having secured control of the line they could begin its construction. This was split into three sections; Birmingham to Winson Green, Winson Green to Oldbury, and Oldbury to Bushbury. The engineers in charge were Robert Stephenson and William Baker, and initially work proceeded briskly. Their report of August 1847 indicated that one third of the 845 yard tunnel into New Street was already complete. Having secured control of the line, the London & North Western were in no hurry to complete the task and so the remaining work proceeded at a more leisurely pace. The progress was also slow on the section near Bushbury due to difficulties in acquiring land. Work finished on 21st November 1851, and was officially announced on 1st December, it had taken just over four years. After the December announcement the Shrewsbury & Birmingham fully expected to start running their trains into Birmingham, but the London & North Western had other ideas. On the 10th January 1851 the Shrewsbury & Birmingham signed a traffic agreement with the Great Western Railway which led to an offer to amalgamate in 1856 or 57. The London & North Western had heard about this and so invoked the terms of their 1847 agreement. They denied access to the Shrewsbury & Birmingham which set the scene for the bitter dispute that followed. On 1st February 1852 the line was opened for London & North Western goods, and from 1st March 1853 a half hourly service started from Wolverhampton to Birmingham which was designed to prevent the Shrewsbury & Birmingham from gaining access . The London & North Western claimed that due to the frequent service it would now be dangerous for Shrewsbury & Birmingham trains to run alongside their own. The Shrewsbury & Birmingham finally accepted an arbitration award that set a high fixed rent for their use of New Street station and their trains started running to Birmingham on 4th February 1854. They finally joined the Great Western on 1st September 1854, and were granted an extension which allowed them to continue to run their trains on the Stour Valley line until the Great Western line could be opened. In the event it remained closed until 14th November 1854 because a bridge had collapsed at Handsworth. Once the Shrewsbury & Birmingham had departed, the line soon became a great success. In the 1870s as many as 120 passenger trains and 50 goods trains ran daily in and out of Wolverhampton.